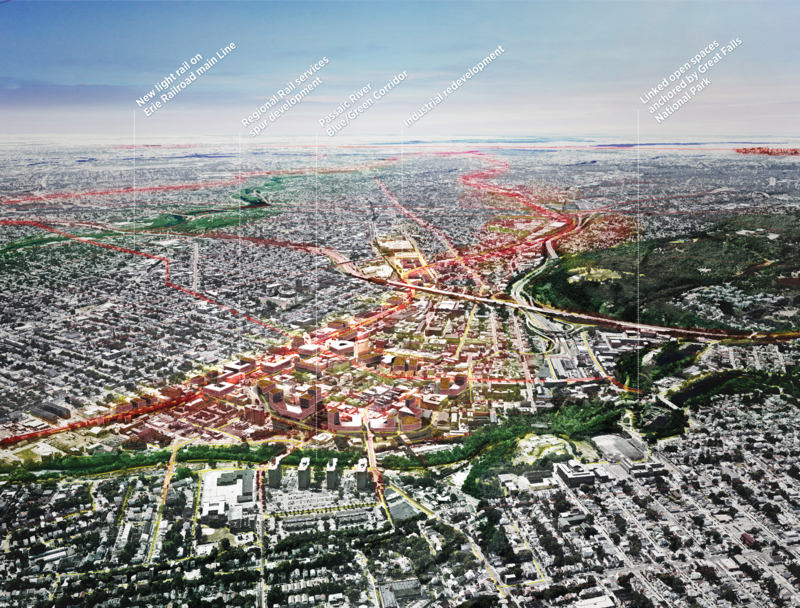 It’s 2040, and Paterson is a vibrant regional center with new rail connections and a growing economy and tourism sector. With new rail connections linking Paterson with Newark and New York City, as well as stations in Passaic and Essex counties, it is now possible to commute from Paterson to Manhattan in about 30 minutes without transferring, roughly half of what it was in 2000. A new light-rail service utilizes the formerly dormant Erie Railroad Main Line, and has reinforced Clifton, Nutley, Belleville, and other places it passes as viable communities, with direct connections to the Newark subway and Newark Penn Station. Faster commutes to New York City have spurred the building of new homes and apartments around the rail station. But Paterson, the third largest city in New Jersey, is also a destination: visitors can easily access Great Falls in Paterson’s National Historic Park, which has dramatically increased visitor numbers. Paterson is also an important downtown destination for restaurants with international cuisine, which provide jobs for local residents. By maintaining and upgrading its existing housing stock and balancing historic preservation with new development, Paterson has been able to remain an affordable and diverse community. It has also drawn creative and food sector companies from all over the region to relocate or start businesses, providing jobs and economic growth. The industrial areas north and south of the downtown have been consolidated and reconfigured to accommodate a new generation of environmentally-friendly, small-scale manufacturing and companies, many of them part of the “maker movement” or focusing on food. 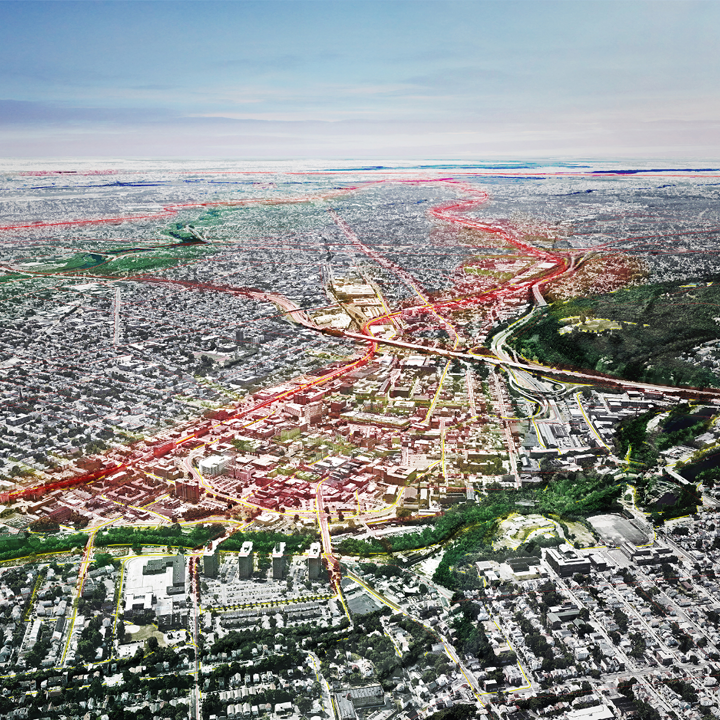 New enterprises occupy formerly vacant warehouses clustered along the Passaic River, which are served both by light rail stations and a bikeway that follows a green belt from the National Historic Park. Development has allowed residents to remain in Paterson and thrive while stimulating a broader, more economically diverse workforce to move there seeking new opportunities. Paterson, once the home of a thriving silk manufacturing industry struggled for many decades with a loss of industrial jobs, and as a result, experienced an increase in crime. Yet things started to change in 2009 when Congress authorized the established of Great Falls as National Park, boosting tourism. The popularity of the Broadway musical Hamilton encouraged visitors to explore Alexander Hamilton’s role in the area’s history, while Paterson rapper Fetty Wap drew attention to the city. A new Master Plan was initiated in 2014, giving local Community Development Corporations more resources to take action. The light rail line was built over three years, benefiting from an inclusive planning process and faster construction timelines. The Master Plan also changed zoning regulations, making it easier to convert one-family homes to two- or three-family homes; construct new recreational facilities: and redevelop the Hinchliffe Stadium. There was more activity in the downtown area, while the government addressed crime and safety concerns. As this change took place, Paterson was able to remain the most ethnically diverse city in New Jersey. New transit links and adapting vacant industrial buildings for creative purposes were crucial to redevelopment and revitalization. Community-based organizations and youth groups played a vital role in the transformation, which was carried out using state tax credits. Placing New Jersey’s first municipal internet network in Paterson was crucial for artists using new digital technologies. New rail lines were built in record time, funding by increased revenues from highway tolls. An inclusive planning process allowed communities to express concerns as the project was designed. 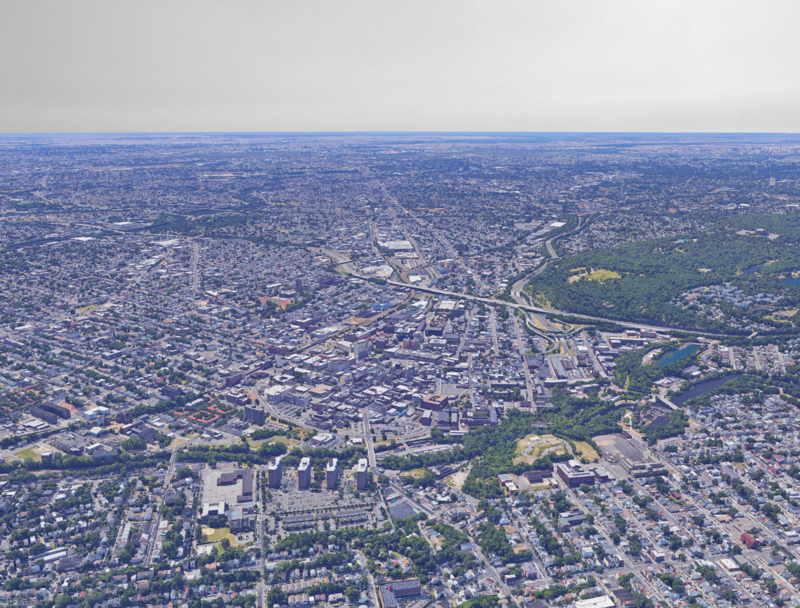 The revitalization of Paterson demonstrated how new transit options can connect people to more opportunity, and bring residents and visitors to jobs and cultural and recreational destinations throughout the region. New transit connections also encouraged development in centers most in need, and helped channel investments. Clean industries, using modern production techniques, were able to flourish in the former factory town.